Priyanka Chopra and the love of her life Nick Jonas got married in a royal setting at the Umaid Bhavan Palace, Jodhpur. The couple released official pictures of their fairytale wedding and they keep on mesmerising us till date. 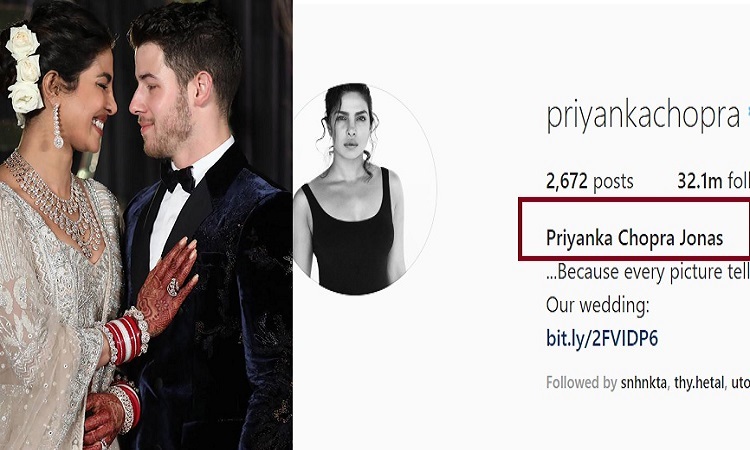 Now, after her marriage to Nick Jonas, the influential actress has changed her social media name to Priyanka Chopra Jonas. Chopra who is making headlines for her regal wedding and her royal reception in Delhi, once again made headlines as she changed her name. Priyanka after hosting her reception on 4th December was back to work on 5th December and was seen attending an event in New Delhi. The newlyweds today were snapped at the Mumbai airport as they returned from the capital. After their first reception in Delhi, reports suggest that the couple will host the second reception in Mumbai for the industry insiders. Though the dates have not been confirmed yet, rumour has it that the reception will take place in the second week of December. Speaking of Priyanka being the new bride, the actress is currently showing off her Mangalsutra, Sindoor and Chooda and her being Mrs Jonas. Yesterday, Pee Cee's friend Sudeep Dutt posted few stills of Priyanka boasting about being Nick's wife.